O.K., that was a surprise this AM! Snow covering our yard along with no Internet connection! Out came my iPad with my playlist! The day needed a bounce, so Pharrell's "Happy" sounded great! Yesterday AM it was chilly! Raindrops fell, but there was a plan! A break in the drizzles brought - a walk outdoors! The daily walks have been missed during our cold, snowy winter months. Sure, the treadmill is second best, but walking outside is just the best! There was a "I have no clue what is for breakfast this AM" dilemma. If I do not know... it is not good. A quick & easy meal was needed. 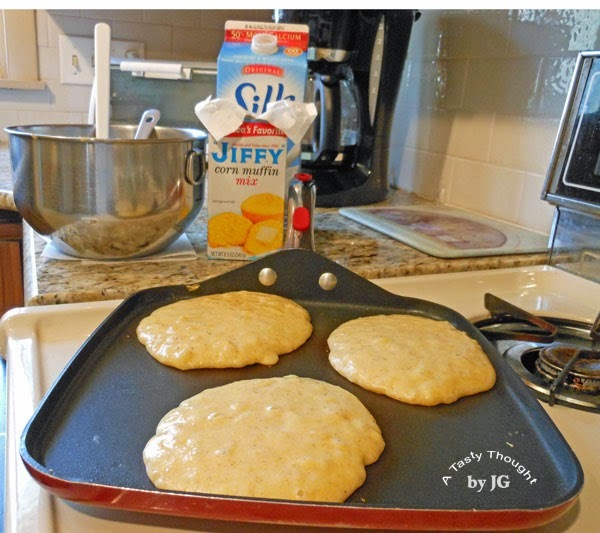 In my pantry was a box of the inexpensive "JIFFY" corn muffin mix. The muffins made with this mix are comfort food from my childhood, so there's always a package in the pantry. One day I read the side of the box and discovered the Cornmeal Pancakes. They are so yummy when Egg Whites, Soy Milk, Olive Oil for baking & sauteing, Cinnamon & Nutmeg are used. There's 1 more addition for me. 2 over ripe Bananas were just waiting in the fruit bowl. Adding those 2 pieces of fruit after mashing them made for very light Banana Cornmeal Pancakes. I now only make these pancakes when adding this fruit. If you have extra pancakes- after cooling, place each in a sandwich bag and then place sandwich bags in a Ziploc Freezer Bag. Into the freezer they go. 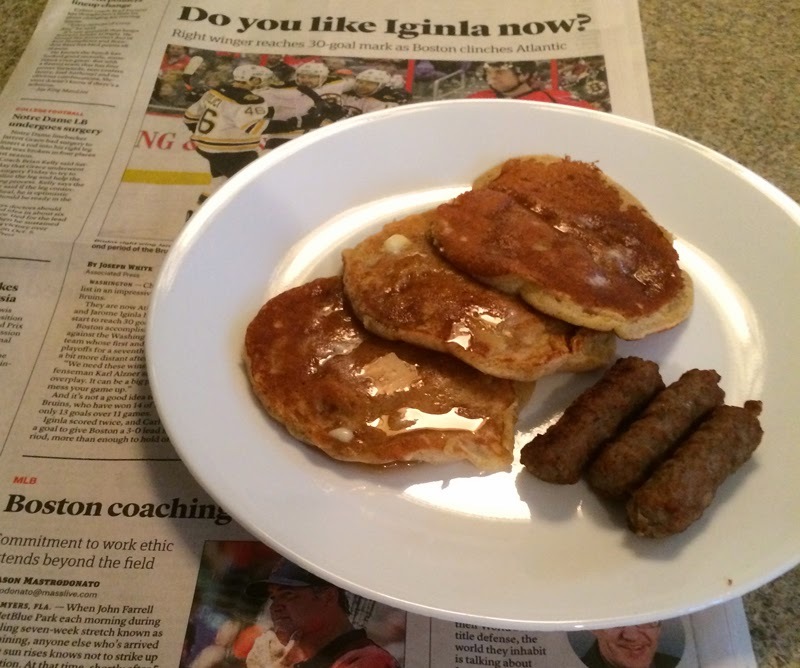 These pancakes will be microwaved for breakfast on a busy AM. Serve these for breakfast one morning. They are so good! The long wait is over! March Madness does bring surprises to the brackets every year. 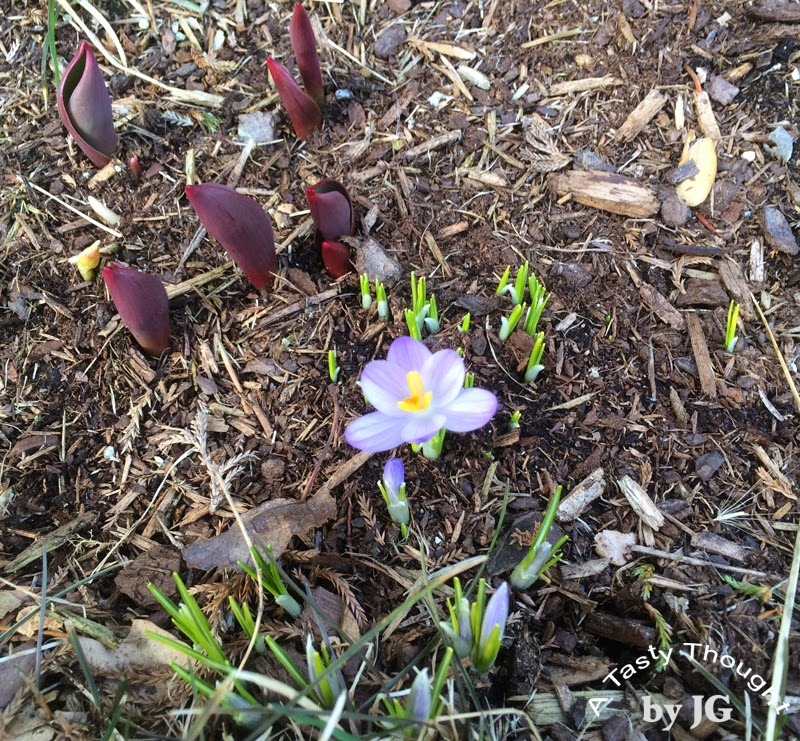 Today, this was the great surprise in our front yard! Now, Spring is definitely here! Cabbage! Carrots! Raisins! Each is tasty & nutritious by itself. Put them together, add a few other ingredients & an easy salad can be enjoyed at dinner! 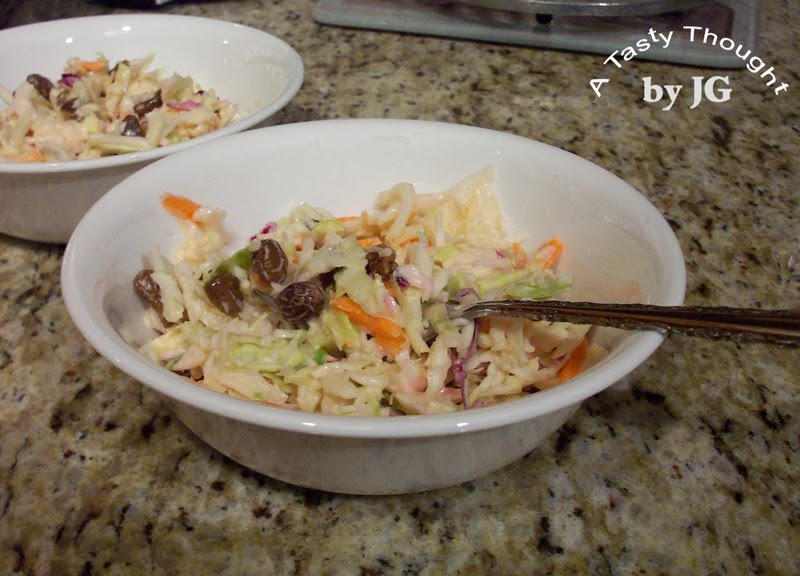 Cole Slaw with Raisins is so yummy! Many years ago, my mother-in-law gave me her delicious, tangy Cole Slaw dressing recipe. In the past I've purchased the cabbage & the carrots to peel/ shred, but these days a bag of these ready shredded veggies makes this side dish very easy to prep. If you're waiting for the warmer days when the local salad ingredients will be available at roadside stands to be purchased, but still enjoy fresh salads, make this Cole Slaw. It's great! Add the raisins for that extra sweetness. This dressing also tastes great in Carrot Salad. In a large bowl combine Mayonnaise and Sugar. Add Milk & Vinegar and stir well. Add shredded Cabbage & Carrots to mixture, stir. Stir well, cover & refrigerate. After 2- 3 hours, stir again & refrigerate. Repeat again in 2- 3 hours. This is a delicious easy to prepare side dish when serving seafood or any entree that has been prepared on the outdoor grill! Bake an Irish Soda Bread! After the month of February that was filled with achoo, cough, cough, cough, achoo suddenly March is here! This is the month when "everyone is Irish"! It's either by heritage, by marriage or by wishing. Every year I bake an Irish Soda Bread (also called Spotted Dog) to enjoy on St. Patrick's Day morn. I remember the year when I had about 2 cups of Fat Free Buttermilk in my fridge & suddenly I decided to make a bread for St. Patrick's Day. 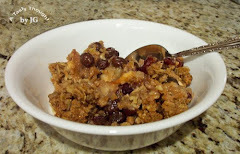 A delicious easy recipe search brought me to my friend Carol's blog, Charli and Me. 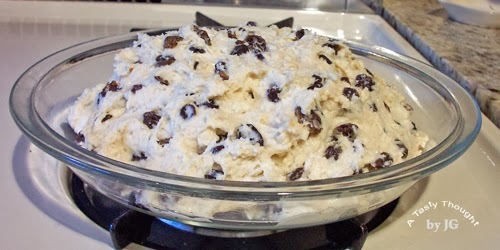 Carol no longer blogs, but I know that she is getting ready to bake her yummy Irish raisin bread for her family, too! It's become a tradition for me to post it for others to enjoy, also! Here's a little background info: The original recipe is from the Will O'Glenn Irish Bed and Breakfast in Michigan with Mrs. Biddy Gahan sharing it. Carol had posted it on her blog and I discovered it after "googling". Many other good cooks made it possible for me to bake & for my fam to enjoy, so now I post it for others, too. It is so good! Have your Buttermilk, Raisins & Butter ready! Low Salt Butter works just fine. Melting the Butter & then cooling it down works easier than using softened Butter. The Raisins soak in hot water before adding them to the very sticky batter. This is one tasty bread! Follow the directions, exactly! Use a cake tester or toothpick to determine if bread is done after removing from hot oven. After the bread cools & is cut into slices, I also freeze a few slices. They are first placed in sandwich bags and then freezer bags and sealed. Ready to be placed in preheated oven! Add cooled melted Butter to dry ingredients, stir in. This is one tasty bread! Follow the directions, exactly! I cut the bread into slices and then place in two sealed Ziploc Bags. 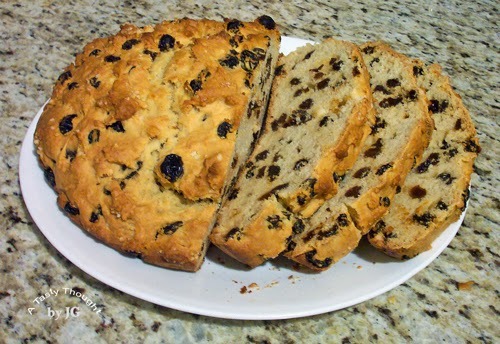 A half slice of Irish Soda Bread is a very tasty treat. The other half slice is located quickly! Extra slices do freeze well, also. They are a special treat later in the month! Theodor Seuss Geisel was born on March 2, 1904 in Springfield, MA. This great children's author & illustrator used the name Dr. Seuss! Memories from his childhood can be found in his wonderful books. It's FuN for children (of all ages) to read them! 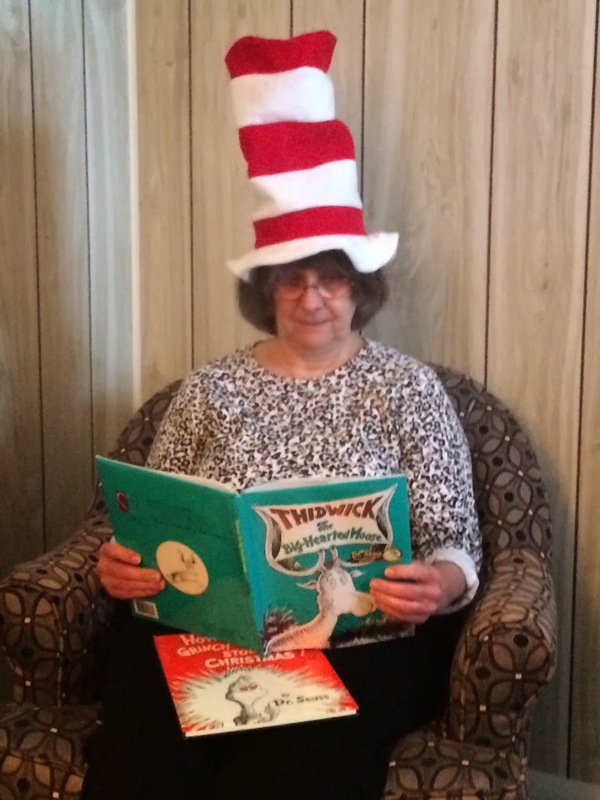 Celebrate the 110th birthday of Dr. Seuss! What is your fave Dr. Seuss book? My fave is "Green Eggs & Ham"!